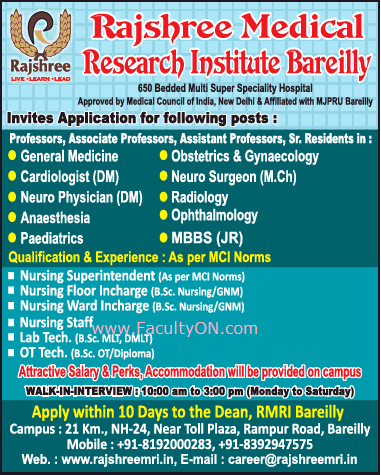 Rajashree Medical Research Institute, Bareilly has advertised in THE TIMES OF INDIA newspaper for the recruitment of Teaching Faculty- Professor / Associate Professor / Assistant Professor / Senior Residents jobs vacancies. Interested and eligible job aspirants are requested to apply within 10 days from 26th September 2018. Check out further more details below. About College: Shobhit University believes in strategic growth as envisaged in our mission and vision, to impart quality education through vertical and horizontal integration. It strives to become a world class university, with a global perspective, that educates the future leaders of the world. How to Apply: Interested and eligible candidates are requested to attend the Walk-in interview along with CV, originals & copies of certificates and recent PP size photo the walk-in address provided below on Monday to Saturday between 10:00 am to 03:00 pm or apply within 10 days to the address given below.